Gary Neville believes that Liverpool are in no shape to pose a worthy challenge for the Premier League title next season. The Reds have been phenomenal this campaign, courtesy of their star-studded front-line, and are the only team to have triumphed over the Premier League Champions-elect, Manchester City, in both the domestic and European competition. Jurgen Klopp’s men convincingly beat the Cityzens 3-0 in the first leg of the UCL quarterfinals at Anfield last night, but Gary Neville still seems adamant that it doesn’t change the fact that Liverpool’s squad ‘isn’t strong enough’ beyond the starting XI. The Manchester United legend tweeted: “Don’t think so no whilst they are in the CL. The way they play is difficult to replicate 3 times a week and their squad isn’t strong enough beyond 1st 11 to withstand injuries and lots of games. (I hope)”. And, of course, one of the Reds’ fan was quick to counter the statement, as he pointed to the fact that Liverpool were on the rise, unlike his former club. “Trouble is Gary is that we’re a team on the rise and yours is in decline. Starting to hurt isn’t it :),” replied one of the Anfield faithful. However, the 43-year-old’s next savage tweet claimed that he’d be worried if ‘Liverpool could actually keep a half decent player’ following the departures of Philippe Coutinho, Luis Suarez and Raheem Sterling in recent seasons. 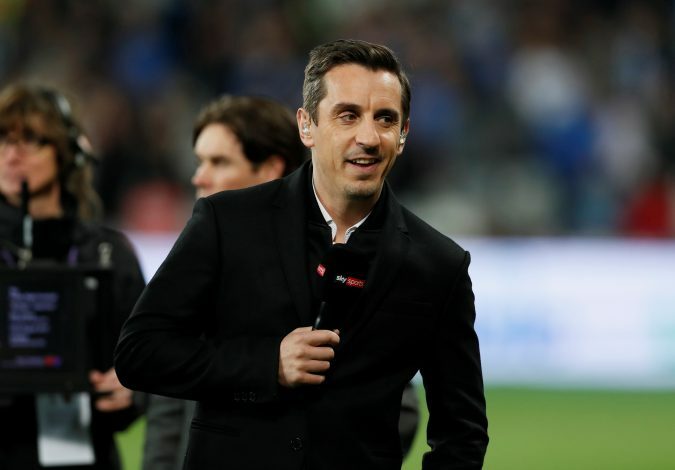 “If you could keep a player that’s half decent I’d be worried…,” added Neville. Meanwhile, Reds’ boss, Jurgen Klopp, is not worried about losing any of his stars at the moment, as is focused to ‘work like hell’ in order to advance to the semi-finals. Klopp said: “We beat the best team in the world so that’s a really good performance. It was good tonight, but I am not interested in being good. In this competition, it is about going to the next round, and we are not in the next round. Let’s talk about it after the next game. “We will really have to work there again like hell. Years ago, I played with Dortmund at Real Madrid and we lost 3-0. Afterwards, everybody told me it was done. I was really angry about it when they said it. “At home, we won 2-0 with six or seven changes in the team – and everyone who saw the game knows we should have won 5-0, 100 percent, without a shadow of a doubt. I know these things can happen.